Cardiovascular diseases are the major cause of death across the globe. It accounted for 17.3 million deaths in 2015 and is further anticipated to claim 23.6 million lives in 2030 (according to an estimation by the World Health Organization). The rise in geriatric population worldwide has resulted in an increased prevalence of the disease. Moreover, change in eating habits, increased stress, smoking, and alcohol consumption, and disturbed sleeping patterns are some of the key factors contributing to the deteriorating health conditions and to the rise in chronic diseases such as diabetes and cardiac diseases. The International Diabetes Federation has estimated that approximately 415 million people were diabetic in 2015 while the number is expected rise to 642 million worldwide by 2040. Therefore, increased incidence of cardiac diseases accompanied by the rise in healthcare expenditure in the medical device industry are expected to lead the growth of the interventional cardiology market. The interventional cardiology devices industry is a multi-billion-dollar market which consists of multitudinous companies involved in the manufacturing of catheters, stents, valves, angioplasty balloons, and other cardiac interventional instruments to meet the increasing demand of people suffering from cardiovascular disorders. The advanced cardiac intervention market provides treatment option for a range of cardiovascular diseases including coronary artery disease, heart valve disease, and peripheral vascular disease, among others. The purpose of this study is to gain a holistic view of the interventional cardiology market in terms of various influencing factors such as recent trends and technological advancements. The scope of this report constitutes of an in-depth study of the global interventional cardiology market, including a thorough analysis of the products across different regions. The market has been segmented into ‘devices’, ‘end users’, and ‘regions’. The ‘devices’ segment consists of both conventional and advanced devices. Advanced devices cover the technologically advanced imaging modalities such as IntraVenous UltraSound (IVUS), Fractional Flow Reserve (FFR), and Optical Coherent Tomography (OCT). The report presents the reader with an opportunity to unlock comprehensive insights with respect to the market and helps in forming well informed strategic decisions. The research uncovers some of the substantial parameters that must be taken into consideration before entering into the market. This research report aims at answering various aspects of the global interventional cardiology market with the help of the key factors driving the market, restraints that can possibly inhibit the overall market growth, and the current growth opportunities that are going to shape the future trajectory of the market expansion. The report includes an in-depth examination of the key ecosystem players and key strategies and developments taking place in this market. Moreover, the report includes chapters on market dynamics (market drivers, opportunities, and challenges) and industry analysis as well. 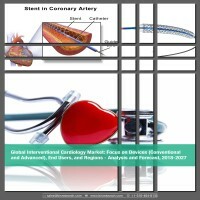 The research study considers the market share analysis for a comprehensive understanding of the global interventional cardiology market, and assesses the factors governing the same. Detailed product mapping have been included in the report. The market (by region) has been further sub-segmented in various countries, and in each sub-segment the key market trends, list of the key players, and the recent developments that have taken place, have been discussed. • What are the major market drivers, challenges, and opportunities in the global interventional cardiology market? • What was the market value of the leading segments and sub-segments of the global interventional cardiology market in 2017? • How will each segment of the global interventional cardiology market grow during the forecast period and what will be the revenue generated by each of the segments by the end of 2027? • How will the industry evolve during the forecast period 2018-2027? • Who are the key players in the interventional cardiology devices and end user market and what are their contributions? • What are the major benefits of the implementation of interventional cardiology in different fields of applications including angioplasty, stent placement, coronary thrombectomy, valvuloplasty, percutaneous valve repair or replacement, and congenital heart abnormalities? • What is the scope of interventional cardiology in the emerging economies of Asia-Pacific and Latin America? • What is the scope for expansion by the key players of the interventional cardiology market in the developed countries of North America and Europe? The key players who have been contributing significantly to the interventional cardiology market include Abiomed, Inc., ACIST Medical Systems, Inc., B. Braun Melsungen AG, Biosensors International Group, Ltd., Biotronik SE & Co. KG, Boston Scientific Corporation, C. R. Bard, Inc., Cook Medical LLC, Cordis Corporation, Edwards Lifesciences Corporation, GE Healthcare, Life Vascular Devices Biotech S.L., Biostense Webster, Inc., Medtronic Plc, Merit Medical Systems, Inc., Novacam Technologies Inc., Koninklijke Philips N.V., St. Jude Medical, Terumo Corporation, and W.L. Gore & Associates, Inc., among others. 8.2 ACIST Medical Systems, Inc.
8.6 C. R. Bard, Inc.
8.10 Life Vascular Devices Biotech S.L. 8.18 W. L. Gore & Associates, Inc.
8.19 Biosensors International Group, Ltd. Rising economic burden of chronic diseases is one of the prime concerns that the healthcare and biomedical device industries are currently facing. The high prevalence of chronic diseases such as as cancer, diabetes, cardiovascular diseases, and respiratory diseases, among others, poses one of the significant challenges across the globe. Furthermore, change in eating habits, increased stress, smoking, alcohol consumption, and disturbed sleeping patterns are some of the key factors contributing to the deteriorating health condition in individuals and a rise in lifestyle disorders. It has been estimated that chronic diseases constitute approximately 43% of the global economic burden for diseases and accounts for 60% of the deaths worldwide. It further holds approximately 65% of the annual healthcare cost of any country and comprises one-third of the global population at present. By 2020, the global spending on diseases such as cardiovascular diseases, cancer, and respiratory diseases is expected to reach $4 trillion. Moreover, growing geriatric population has resulted in increased prevalence of lifestyle disease that has led to an upsurge in the demand for advanced medical diagnosis and treatment. Cardiovascular diseases (CVDs) represent the leading cause of death globally. According to the World Health Organization (WHO), CVD was estimated to claim 17.3 million lives, a number which is anticipated to grow to 23.6 million by 2030. Of these, coronary artery disease and stroke resulted in approximately 7.4 million deaths and 6.7 million deaths respectively. Interventional cardiology deals with the treatment of structural heart diseases specially employing the use of interventional catheters. It involves the treatment of coronary artery disease, heart valve disease, and peripheral vascular disease, among others. With increase in the prevalence of cardiac diseases, advanced interventional cardiology devices are gradually becoming an integral part of the medical device industry. The purpose of the study is to gain a holistic view of the advanced cardiac intervention market in terms of various factors influencing it such as recent trends and technological advancements of the market. The scope of this report is centered upon conducting a detailed study of the devices allied with the cardiac interventional devices market, which includes both conventional devices and imaging modalities. The global advanced cardiac intervention market is segmented into three different parts: devices, end users, and geography. The global market value was estimated using these three different approaches and was validated with one another. These segments are further segmented into several sub-segments to ease the market estimation. The global interventional cardiology market was estimated at $14.69 billion in 2017 and is anticipated to reach $24.96 billion by 2027. With the rise in the demand for advanced medical devices to treat cardiovascular diseases, increasing geriatric population with higher life expectancy, and new product launches by several conglomerate companies, the cardiac intervention market is expected to witness moderate growth. The emergence of advanced imaging modalities such as IntraVenous UltraSound (IVUS), Optical Coherent Tomography (OCT), and Fractional Flow Reserve (FFR) has led to the growth of the market. The global interventional cardiology is segmented by the geographical regions into North America, Europe, Asia-Pacific, Latin America, and Rest-of-the-World (RoW). North America is the leading contributor to the global interventional cardiology market. However, the Asia-Pacific is expected to grow at a CAGR of 7.12% in the forecast period 2018-2027. The global interventional cardiology market for advanced devices is majorly dominated by the U.S. and the European players. The key players who have significant contributions to the global interventional cardiology market are Abiomed, Inc., ACIST Medical Systems, Inc., B. Braun Melsungen AG, Biosensors International Group, Ltd., Biotronik SE & Co. KG, Boston Scientific Corporation, C. R. Bard, Inc., Cook Medical LLC, Cordis Corporation, Edwards Lifesciences Corporation, GE Healthcare, Life Vascular Devices Biotech S.L., Biostense Webster, Inc., Medtronic Plc, Merit Medical Systems, Inc., Novacam Technologies Inc., Koninklijke Philips N.V., St. Jude Medical, Terumo Corporation, and W.L. Gore & Associates, Inc., among others.